Trinity University Press, 9781595347800, 248pp. 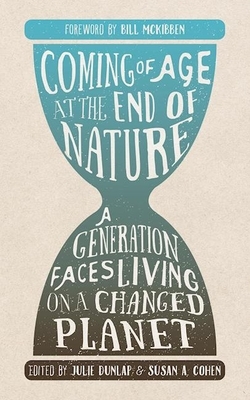 Coming of Age at the End of Nature explores a new kind of environmental writing. This powerful anthology gathers the passionate voices of young writers who have grown up in an environmentally damaged and compromised world. Each contributor has come of age since Bill McKibben foretold the doom of humanity's ancient relationship with a pristine earth in his prescient 1988 warning of climate change, The End of Nature. What happens to individuals and societies when their most fundamental cultural, historical, and ecological bonds weaken--or snap? In Coming of Age at the End of Nature, insightful millennials express their anger and love, dreams and fears, and sources of resilience for living and thriving on our shifting planet. Twenty-two essays explore wide-ranging themes that are paramount to young generations but that resonate with everyone, including redefining materialism and environmental justice, assessing the risk and promise of technology, and celebrating place anywhere from a wild Atlantic island to the Arizona desert, to Baltimore and Bangkok. The contributors speak with authority on problems facing us all, whether railing against the errors of past generations, reveling in their own adaptability, or insisting on a collective responsibility to do better. Julie Dunlap is a writer and researcher who teaches and develops environmental science and sustainability courses for the University of Maryland University College. She is a longtime board member of the Audubon Society of Central Maryland and the coeditor of Companions in Wonder: Reflections on Children and Adults Exploring Outdoors Together. Her doctoral research at Yale University focused on children's attitudes and beliefs about wildlife, and her postdoctoral work at Yale examined environmental education at zoos and aquariums. She is the author of the children's books John Muir and Stickeen: An Icy Adventure with a No-Good Dog, Louisa May and Mr. Thoreau's Flute, and Parks for the People: The Life of Frederick Law Olmsted, among others. She lives in Columbia, Maryland. Susan A. Cohen is a professor of English and coordinator of creative writing at Anne Arundel Community College. She is the editor of Shorewords: A Collection of American Women's Coastal Writings and coeditor of Wildbranch: An Anthology of Nature, Environmental, and Place-Based Writing, and she is a founding member of the Association for the Study of Literature and the Environment. She lives in Arnold, Maryland. Foreword by Bill McKibben and contributors include Blair Braverman, Jason Brown, Cameron Conaway, Elizabeth Cooke, Amy Coplen, Ben Cromwell, Sierra Dickey, Ben Goldfarb, CJ Goulding, Bonnie Frye Hemphill, Lisa Hupp, Amaris Ketcham, Megan Kimble, Craig Maier, Abby McBride, Lauren McCrady, James Orbesen, Alycia Parnell, Emily Schosid, Danna Staaf, William Thomas, and Amelia Urry.